Kali Puja is performed to diminish the ego and all negative tendencies that hinder spiritual progress and material prosperity. This is a special puja as it is performed on Amma's birthstar (Karthika) at Amritapuri. Kali Puja will occur on 13 dates during the year 2019. Please send your Kali Puja requests atleast one week prior to the above mentioned puja dates. The cost for the puja is $250.00. 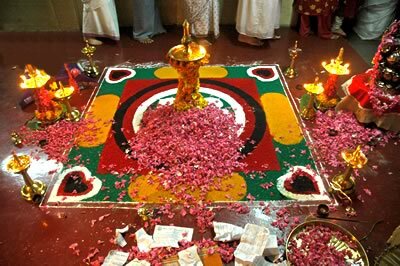 Prior to this elaborate puja, the temple verandah is specially decorated with colorful sand yantras. The puja is offered to a lamp representing the Goddess, placed at the center of these yantras. The puja starts with a worship of the Guru and Ganesha (the removers of obstacles). The central aspect of the puja is the symbolic offering of the five elements of creation to God. Our body is composed from these five elements: ether, air, fire, water and earth. The puja symbolizes the surrender of the devotee to the Lord. Each element is represented by a material symbol, such as flowers, or fire, etc. These are offered at the foot of the lighted lamp. The desire of the devotee to offer his or her surrender is effected by these symbolic offerings. During the entire puja the temple resonates with the continuous chanting of the holy names of Kali. The puja ends with the offering of the arati flame (symbolic of consciousness) and sweet pudding (symbolic of union with God) to the devotees.